If you were to peripherally read the media headlines in the last few weeks, you may believe one or more of the following: 1. Pakistan is or will become a failed state, 2. The Taliban is winning the war against the military, and 3. The militants’ influence is slowly seeping into the country’s urban areas. It is always easier to accept negative news at face value, because, let’s face it – that’s what sells. But what is really going on? Currently, the Pakistani military is engaged in an offensive against militants in Buner district, the area just 70 miles from the capital where Taliban fighters consolidated control late last month. According to CNN, security forces will likely advance to Swat in the coming days. The military’s immediate goal though is to clear Taliban militants from Pir Baba, an important religious shrine in Buner. However, according to the Inter-Services Public Relations (ISPR), the military have accused the Taliban of “holding 2,000 villagers as human shields” to halt the military’s onslaught into the area. BBC’s correspondent says they have not yet verified this claim. He began eating and bunking with his men to improve morale, and seeking the counsel of his officers—not a common practice in the hierarchical Pakistani military—on how best to engage the enemy and attract local support. In August 2008 he launched Operation Shirdil (“lion heart”), similar to the U.S. “surge” strategy in Iraq. Khan encouraged his troops to work with local tribes, shrewdly dividing pro-Taliban from pro-government elements, and, to gain legitimacy, backed tribal militias and sought the acquiescence of local jirgas (tribal councils). At this time, we can never be truly certain of who is winning, particularly since both sides, the military and the militants, are not just fighting a tangible offensive, but are also trying win a war of perceptions. As the numerous media reports roll in, it is important to look beyond the headlines and remember what is realistic. According to Dawn‘s Cyril Almeida, we do know that the rise of militancy is a more dangerous problem than it was five, six, or even seven years ago. However, he noted, “Even if they number in the tens of thousands, the militants today can’t really overrun the country and knock over the state. What they can do though is push us into a low-level equilibrium, where violence is endemic, security scarce, the economy is in the doldrums and quality of life is on the wane.” That in itself is obviously a very dangerous development. So what do we need to do? As I have stated again and again, the government must adopt a nationwide counterinsurgency strategy to bolster the military’s offensive on the ground. Given that the Taliban has a relatively sophisticated communications apparatus, their propaganda must be matched and countered by a national strategic communications strategy, ultimately selling the war to the people and swaying the masses further against these militants. Pakistan’s police forces and Frontier Corps must also be better trained and bolstered. The CS Monitor cited RAND’s Christine Fair who asserted, “We have to invest in the police…The police are thoroughly exposed, they are poorly equipped, they are outgunned, they are undermanned, they are poorly trained, and they are sitting ducks for the insurgents.” These forces need financial and security assurances – for themselves and for their families. The youth’s response to this volatile security situation has been especially refreshing. On Saturday, Dawn’s Nosheen Abbas wrote, “The youth of Islamabad is not sitting idle in the face of growing religious extremism and Talibanization in some areas of Pakistan. Even if individually some are trying to combat ‘Talibanisation’ in a manner they deem fit; and some are even finding creative avenues.” Abbas Saleem Khan, who organized a protest in Islamabad against the Taliban, told her, “By not joining in, you are literally giving the Taliban a free pass to allow them to walk into your streets and homes and tell you how to conduct your daily affairs. The heart of the matter is that we will stand up against the Taliban and steer this country towards the vision it was created for.” Nosheen Abbas also cited Amna Mawaz, a university student, who plans to raise awareness through theater, noting, “I figured after attending protests and seminars that no one will listen to you if you give a lecture but rather through something entertaining like theater. I think if you keep it light and yet have a meaning one can spread awareness about extremism.” On social networking sites like Facebook and Twitter, young Pakistanis have established groups, organized rallies, and mobilized others to speak out against extremism. You know I need your help right now, but please dont ask me to kill my brothers. Please dont tempt me with your virgins. Please dont bribe me with your money. Please dont ask me to murder for you. I was shocked how commentators on YouTube missed his point completely. Sigh! I agree that a propaganda strategy is very important to engage in. You cannot wage war without rumors, and any military planner that does not put propaganda on top of his agenda is a bad planner. This should be coupled with a federally controlled educational curriculum that stresses a modern view on Islamic studies for school children. I also agree that the problem is blown way out of proportion by the media, especially in the west. There is a 0% chance of a Taliban takeover of Islamabad, or even Peshawar. The Pakistan Army and Capital Police would both have to be totally dissolved before that could ever happen. The issue is in my opinion strictly a criminal problem and should be dealt with as such. However, some have argued that the militancy is being supported by the ISI and Pakistan Army themselves for obvious motives. The US is stepping up military aid largely because the violence has gotten much worse, not because of progress. If all militants were suddenly squashed, why would Pakistan require increased amounts of military aid and technology? Here’s the link the rest of the article. Thoughts? Very interesting article… I generally think economics is the prime motivating factor behind all political and military decisions, so it would not surprise me one bit. The Pakistan Army definitely appears to act not in the interest of the country, but in the interest of itself. As such, a “phony” insurgency would seem to logically be a positive thing to pursue. It has certainly resulted in great deals of financial growth for the Army. It pushes the United States against a wall and essentially threatens to hand over a nuclear weapon to Islamists if not supported in exponentially increasing amounts. In other countries, such as Iran, the military plays an even greater role in the economy. The IRG engages in businesses from carpet manufacturing to oil trading to retail outlets. Well, except that the Army is not the only one guilty of such actions (if what the Guardian author said is true). What do you do when your country’s own politicians, some religious leaders, even members of the judiciary all act tyrannical to some degree? It does kind of sound like Kiss from a Rose! Haha! Amazing post, Kalsoom. I don’t know what their numbers are and in what kind of strength they would come out, and frankly speaking I don’t know much about them but the Sunni Tehreek came out and condemned the enforcement of Sharia at gunpoint. So not only are so-called “liberals” condemning this but so is this religious party. That is great Yawar. It was also a good development when the Tabilighi Jamaat, which is largely apolitical in nature, came out against the Taliban as well. I think the number one way to break the Taliban’s influence is having groups deemed legitimate from the right-wing distance themselves from Taliban-linked militants. We often tend to lump Pakistan’s right-wing into one group, when really we need to recognize the nuances and divisions that exist among them. If we distance the Taliban from the right-wing by bolstering those who oppose them, we may break the constituency of people that are ambiguous on how they feel about the Taliban. Thanks Sulaiman! I think the military and the government are finally starting to get the importance of perception management, but they need to utilize it better. The government for instance needs to do more than just release statements condemning bombings, they need to turn that condemnation into proper messaging, using key words and phrases that strike a chord with the public. Judging what it means to be winning the war is so vague in this situation. As far as objectives are concerned, the army is achieving certain objectives, but if the army achieves those objectives, and the civilian government doesn’t follow up on those objectives to “maintain” the peace, the objectives are useless. For instance, taking responsibility for the displaced peoples, rebuilding, further development and then the age old problems of the area such as a functional judicial system etc. I mean with Shariah in the picture in these areas, how on earth is the civilian government planning on bringing tourism back to swat even if the Taliban is pushed out? That was the livelihood for the majority of Swati residents. If they don’t provide an alternative, then the region always remains a plausible option for militant recruiting. They have yet to provide any clues as to how they are planning to rebuild these peoples livelihoods. As far as the Guardian article is concerned the writer fails to mention that any leader in power whether it be our political dynasties or military leaders, land allotments are the first order of the day when in power. It seems that while Ayesha Siddiquas claim is correct, it is probably taken wildly out of context. She says “more concerned with”…I am left wondering what she is referring to that they (the military) are “less” concerned about. Pakistan’s security? National interests? I don’t buy the notion completely that the army is not looking out for Pakistan’s interests. I think they make strategic mistakes, but I think they do have Pakistan’s best interest in their intentions. And the writer of that piece also conveniently leaves out Pakistan’s economic successes under military rule. Granted, the military has screwed up pakistan’s democratic evolution and if our democratically elected leaders were more able, maybe that wouldn’t have happened. But as far as this war is concerned I think it just comes down to being unprepared. Nobody would say that America’s military is “inept” because they failed in vietnam or in the early stages of the Iraq War. Those were times where they were facing unconventional enemies, and they had to learn on the job. Just as Pakistan is facing the same thing, the army is learning on the job. I think to say that they are inept is a little harsh, and frankly, ignorant when it is one of the only institutions in the country that runs like a professional organization. It is more organized and less corrupt then our judicial system. Is it not also a failure of our civilian leadership to not be able to control the ISI? The reason why the army can take over Pakistani politics is also a result of severely corrupt and weak leadership by our civilian leaders. For instance, in Turkey, the Army is seen as the guardian of Ataturks vision, and anytime the country has strayed the military has shown its strength. The political leaders haven’t failed miserably at protecting the founders vision in Turkey which is why the army hasn’t stepped in, but they are always in the background. If our leaders didn’t fail so miserably I don’t think our military leaders would play such a big part. I know I sound like an apologist for the army, but I thought that article was ridiculous. The army HAS become unaccountable to the state (as the writer says), but it is also ridiculous to think that the army has become unaccountable completely with no responsibility lying at the hands of the state. I think both parties are equally responsible for Pakistan’s failures. I actually agree with you – I wasn’t sure if I believed the author’s article that the military was corrupt and inept. If they are acting out of the country’s interest, and are one of the few institutions to do so, than that’s not exactly corrupt. The issue comes when we have no sense of coordination between the state, the ISI, and the military. Here’s my devil’s advocate question though – when Musharraf was in power (before he shed his General’s title) – his first few years of rule marked a synergy between the state and the military because the state WAS the military – and yet, despite that, we still saw promises from the state that were not carried out by the military/ISI post-9/11. Is that because it wasn’t in the military’s interest because they didn’t feel it was in the national interest? And, if you don’t agree with that assertion, do you think a military government is a better fit for Pakistan? Thanks, yeah good questions. And i’d like to know your opinions on them as well. I think there are some corrupt elements of corruption in the military as is just natural in most organizations. And I agree, there is not much coordination between the three branches you mentioned (ISI,military and govt.). Although this is not that unusual as the CIA has historically conducted covert wars and programs in countries without the approval, and sometimes even knowledge of Congress, the White House and/or the judiciary. Of course, certain members of each branch have to work together covertly to enable such activities. Intelligence agencies tend to function in this manner in a lot of countries, at least countries which have strong intelligence capabilities. Also, when Musharraf was in power, I suppose it comes down to exactly what promises you are talking about. I can’t really opine on whose interest was being taken into consideration unless I know what situation you are talking about. If you are talking about the Taliban for instance, the Taliban has usually been in the states interest, even under Benazir’s leadership. I think the Taliban has just just been considered a security and state interest in tandem by both civilian govt. and the army. Although I think the army are more adamant and confident about the Taliban’s value. So to answer the question I think, as you implied, that the military didn’t fulfill those promises under Musharaf because the military interest was considered the national interest. I suppose that is where the crux of the problem lies. Arrogantly at times, the military assumes it is the protector of Pakistan’s interest and even if they are wrong they still believe it is in the national interest of the nation. As far as a military government is concerned I don’t think it’s healthy for Pakistan to rely on a military government even if there are eras of progress under it. It stunts the countries political growth and as a result Pakistan is still an extremely immature society, politically. And that constant fluctuation between military and civilian government just scares the %*&* out of other countries and investors (foreign and local). As failed as our leaders have been, I think democracy evolves as a trial and error process, or it can in our case. Eventually if the country goes through decades of bad and okay leaders, the parties, the public and the nation as a whole will start to see better leaders emerge. At least a functioning system will start to emerge. Or it could happen as soon as a decade from now. It’s just a matter of evolution I think. That is where the army I think has the whole equation screwed up. Because they do end up running the country fairly well (I know this can be argued as well) they never trust the public or the politicians to get it right. It’s arrogance in the end. Some of the older members of my family who were in the army and some of their army buddies just naturally refer to politicians as “those buffoons” and that is how they are seen by a lot of the military. At least for the last couple generations. Hahahahah. I think our democracy can learn from the professionalism in the army. I mean you go to any army run institution in pindi and it is so much more professional than say, Pakistan Television for instance. One can argue that the military has more money, but money doesn’t necessarily buy you professional attitudes. So that is where our government can learn from the military. I don’t know it’s easy to keep going in circles with this whole issue, and that is what I end up doing. What do you think? Ok now onto Shaheryar’s comment: The US is certainly no stranger to a lack of coordination among its agencies – helllooo, 9/11. The 9/11 Commission Report details just that – how the lack of coordination, esp. between the FBI and the CIA led to lapses in information that would have been vital to have prior to the 9/11 attacks. I agree, I think corruption exists everywhere in Pakistan. Relatively and historically, the Army has been viewed as Pakistan’s least corrupt institution, which is why the ppl constantly turn to it to protect the national interest. The problem of course arises when even the term ‘national interest’ is relative. For the military (and that may be changing now) and certainly the ISI, India has been Pakistan’s biggest threat. Groups like the LeT, therefore, were used as proxies to fight our war – in a sense propping them up and unleashing them unrestrained. 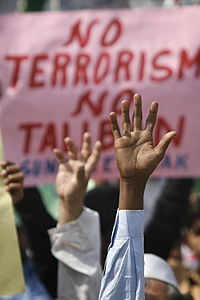 For the govt, the Taliban is now seen as Pakistan’s greatest threat. Many members of the civil society now accept that as truth. The military has also seemed to understand that now, although I’m still cautious about how sincere their commitment is – are they still looking over their shoulders to our eastern border? Probably. What I’m worried about is where the ISI falls in this debate – the media continuously discusses the government and the military and what their views and actions are in regard to the Taliban, but what about the ISI, and more specifically, the so-called “rogue” element of the ISI? Great post Kalsoom – the headlines certainly have left me feeling like the end is nigh of late – Well done pulling different reports/perspectives together! Yes, I think you raise some of the key issues there. The army is OBSESSED with India and still sees it as the number one threat. This is where the govt. and the military is differing these days as you pointed out that civil society is mostly in agreement about the taliban/extremism being the biggest threat. They are still interested in keeping most of the troops on the eastern border as opposed to the western border. By most accounts the military is still threatened more by India. That is also because the army still does have a portion of the Taliban under their control, and that is the Mullah Omar faction. So I think they feel that when the focus of the Taliban intensifies towards afgh. and the US, they can ease the heat within Pakistan. In reality, not all the Taliban and the numerous other militias now operating throughout the country, are in their control. So they may have bitten off more than they can chew. But i think the rationale is that as long as they have the powerful Mullah Omar faction in control (who’s objectives lie in afghanistan) then they still have the taliban as a trump card in afghanistan against India and once the US leaves. And I’m also wondering about the Jalaluddin Haqqani militia who is immensely powerful and experienced. Who is controlling them? They are big players. Of course the ISI are major players in this whole military-militia nexus. I am not sure about the ISI because it is such a secretive and hard to access organization. God knows where there loyalties and what their objectives are these days. Even more so, God knows about the rogue elements. I think it would all depend on how the army interacts with the ISI. If the army does their job and controls the ISI then they will act in tandem with the army’s interests. And I suppose that is better than the typical ISI “state within a state” situation. It’s just become such a clusterfu– of militancy in the country it’s hard to know who is who, and who’s doing what and what will come of it. There is a hidden optimism in my head that the army and moreso the ISI are still able to pull the strings behind a lot of these militias. And when the time comes they will be able to pull the strings in the right direction. Wishful thinking probably. I’m not as optimistic. The Laskhar e Toiba went from being a guerilla organization geared towards fighting a proxy war against India to buying into more Al Qaeda-like ideals. It seemed to be the case, like during the Soviet War, of the ISI/military (and the US for that matter) of bolstering these groups and creating a monster. And the more we fight these groups as one large offensive, the more likely they are to coordinate amongst each other and bind together. There are obviously nuances and differences among these terrorist organizations that can and should be exploited – from groups that are more criminal in nature to more rhetorical/overarching orgs like Al Qaeda or even the Afghan Taliban. But I think right now the military is more concerned with eliminating them – but, as we’ve seen in the past, that is only a temporary solution. I’m hopeful now that the military is trying something new – as Haider Mullick mentioned in his article – involving not just aggressively targeting militants but also focusing on ideologically targeting the population in their midst. Pakistan issue is becoming hot again. There are multitude of experts on CNN, PBS and FOX opining on the issue. Anybody who knows anything about military or foreign affairs whether he knows anything about Pakistan or not, has become an expert. Picture in the media being painted on Pakistan is that Pakistan is essentially a ‘Banana Republic’. It is true Pakistan has a weak leadership but it definitely is not Afghanistan or Congo .It sure has a history of corruption and general tendency to favor Islamic life but the Pakistan Military is trained and brought up in the British school. It knows well the perils of Talibanization of their country. These so called experts tend to paint the picture that one of the largest army in the world will suddenly capitulate to Taliban and will let Taliban flag fly high in the Pakistan. Yes, Taliban is sixty miles away from Islamabad but in reality Buner district and even Swat valley is not Islamabad. These areas are generally ignored . Although, Buner is sixty miles far from Islamabad but in strategic terms, it is 6000 miles away from Islamabad. I agree that putting pressure on Taliban and Pakistan government to contain the Taliban threat is helpful but please spare us the generalizations that Pakistan is as weak state as present Afghanistan is or as Afghanistan was when Taliban came to power. The concept that when sun rises up tomorrow or something in the near future, Pakistan government will be displaced and Taliban will take over is juvenile at best. These simplistic assessments only create more resentment and defeat the purpose. Let us give the army of the Pakistan and people of the Pakistan their due and please get us some real experts. Thanks for your comment Gigi. I agree that Pakistan is certainly not a banana republic – that title goes to many states in Africa which are a lot worse off than us. I think Gilani’s speech today gave pol legitimacy to the military offensive and the country’s civil society is behind the fight against the Taliban. I think every news agency is grappling for any expert on Pakistan since it’s news-worthy. In my opinion, I think one of the best ppl to speak on Pakistan is Shuja Nawaz, author of Crossed Swords, and from my conversation with him today, it seems he has had about four interviews a day every day this week. He has a real understanding of the nuances of Pakistan, which is different from many Western experts on the country, although I think Christine Fair from RAND is pretty good as well.